Product prices and availability are accurate as of 2019-03-10 13:10:27 UTC and are subject to change. Any price and availability information displayed on http://www.amazon.com/ at the time of purchase will apply to the purchase of this product. Before you know it, all those "gotta-have-em" purses can turn into an overwhelming "can't-find-a-place-to put-em" dilemma! Jokari and Paula Deen to the rescue with a stylish purse rack designed to keep shoulder bags, totes, clutches with wrist straps (and just about every other style of purse you can imagine) neatly organized right inside your closet. 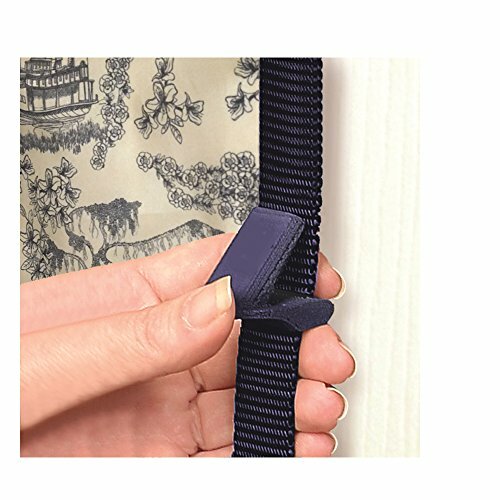 The purse rack features 16 adjustable hooks and fits easily over the closet door with low-profile, not-scratch hooks. Its delightful Southern living toile pattern was inspired Paula's life in Savannah, Georgia; it's exclusive to Jokari and, because the beautiful navy and off-white design is printed on durable and stain-resistant 150D polyester, you know it will serve you (and your purses) well for years to come.